Former IAS officer Aparajita Sarangi is the latest in the list of civil servants who quit their jobs to enter politics. Sarangai joined the BJP Tuesday in the presence of party president Amit Shah. A 1994-batch Odisha-cadre officer who sought voluntary retirement, Sarangi was serving as the joint secretary in the rural development ministry, in-charge of the rural employment guarantee scheme — MGNREGA. Incidentally, Sarangi was handpicked by then rural development minister and Congress leader Jairam Ramesh in 2013 to handle MGNREGA — a scheme very dear to the Congress. 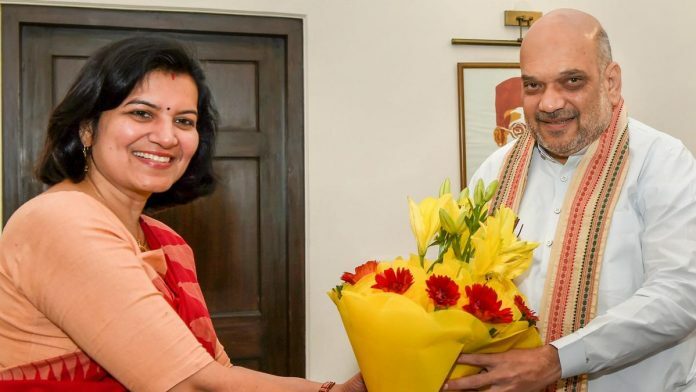 Sarangi, in fact, was known to enjoy Ramesh’s confidence, and was one of the officials in the ministry he relied on for her administrative capabilities and understanding of issues. Sunil Arora is all set to take over as the new chief election commissioner from O.P. Rawat on 2 December, which happens to be a Sunday. Arora had a 38-year career as an IAS officer and donned several hats as a civil servant. But some former CECs have been concerned that he is the least experienced CEC in terms of the number of assembly elections he has overseen as an election commissioner before taking charge as CEC overseeing general elections. Some former CECs are said to have raised this point at a closed-door meeting that was held at the Election Commission a few months ago. While Arora will have overseen 11 assembly elections — including the five ongoing ones — before he presides over the 2019 general elections, his predecessors such as V.S. Sampath, Navin Chawla and N. Gopalaswami had presided over 25, 23 and 31 assembly elections respectively before they oversaw general elections as CECs. UIDAI CEO Ajay Bhushan Pandey’s plum posting as revenue secretary has not come as a surprise to many in the corridors of power. They see it as Pandey’s reward for his unflinching support to Aadhaar and for steering it through a difficult legal process and tricky PR phase. Aadhaar, although a Congress government initiative, is known to be very close to Prime Minister Narendra Modi’s heart, with the PM holding bureaucrats who understand and support it in high esteem. Pandey isn’t the only example of this. Former IAS officer R.S. Sharma — who had served as the director general of UIDAI in its initial years and is known to be an ardent supporter of Aadhaar, initiating several platforms based on it even during his term as chief secretary of Jharkhand — has also been a favoured civil servant. Sharma, who was appointed secretary of the important department of electronics and information technology, was given the sought-after posting of chairman, Telecom Regulatory Authority of India after his retirement. Sharma, who courted controversy by putting out his Aadhaar number on social media as a challenge to those who question its security, was then given an extension of two years as TRAI chairman, just a day before his term was to end in August this year. The ongoing campaign for the Rajasthan assembly polls has caused a tricky situation for the government. The International Film Festival of India, being held in Goa, will be given a miss by information and broadcasting minister Rajyavardhan Rathore as he has been asked by the party to stay back in Rajasthan for canvassing. The ministry was making last-minute arrangements for a government representative for the closing ceremony of the festival. Tourism minister K. Alphons has now been asked to do the needful in Rathore’s absence, along with Delhi BJP president Manoj Tiwari who is expected to bring in celebrities along for the closing ceremony. Also read: Has the Internet killed the film critic in India? During the foundation stone laying ceremony of the Kartarpur corridor held at Dera Baba Nanak in Punjab, the Facebook page of the Congress-led Punjab government was live-streaming the entire proceedings. All was well with the streaming until the time Union minister and Akali leader Harsimrat Kaur Badal began her speech. The moment she began her speech the live-streaming stopped only to restart when her speech was finished. Punjab government officials responsible for the streaming explained that a technical flaw had led to Badal’s speech being cut. Any takers? While the debate over legalisation of marijuana has gathered some momentum in the country of late with Congress MP Shashi Tharoor strongly batting for it, Union minister Maneka Gandhi had advocated for the legalisation in 2017. At a meeting of a group of ministers (GoM) held in July 2017, Gandhi strongly advocated legalising the psychoactive drug — only to be dismissed by other ministers such as Nitin Gadkari and Sushma Swaraj. Swaraj, in fact, told Gandhi that these were Western and liberal ideas and not in sync with “Indian culture”. Soon after, the information was made public, with Gandhi being left to justify her stand to the media. Turns out, Gandhi was never made part of any GoM after that. Enforcement Directorate chief Sanjay Kumar Mishra has not only locked out the media, refusing any sort of interaction, but has also not been interacting much with his teams, leading to discontentment among the agency officials. Mishra, a 1984-batch Indian Revenue Service (IRS) officer, was appointed the principal special director in the central probe agency on 27 October and was later made ED director, a post that fell vacant after Karnal Singh’s retirement. ED officials say that Mishra is so “cagey” following controversies surrounding the ED and the CBI that he is “not even moving files” nowadays. Sunil Arora I think retired from regular service in 2016, and was given a new job by the Modi government which enabled him to continue. He is obviously VERY LIKELY to be “indebted” to the present regime. I am not casting aspersions on Mr Arora’s integrity, but the above somehow brings to mind the name of an earlier Chief Election Commissioner, AK Joti, who was handpicked for the job out of Gujarat (where else!). Mr Joti allowed a road show of Mr Modi or announcement of some benefits, I don’t quite remember, when they weren’t allowed immediately before the Gujarat election. Then, days before his retirement he took some decisions which looked hurried. All this gives reason for uneasiness.